Penticton, February 15, 2018 – The days are long and the numbers hypnotizing during the busy season for professional accountants, whether you work in a firm during tax season or a corporate setting during fiscal year-end and forecasting. How can you train your mind to focus on the task at hand when you feel your attention slipping away? In part one of this article, “Meditation for Accountants: Keeping calm through a taxing season,” I provided you with the basics and benefits of meditation, from one CPA to another. 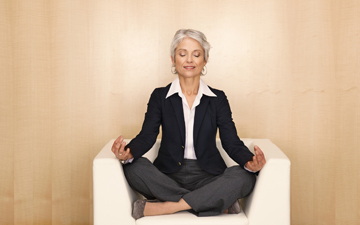 In this article, I want to “focus” on mindfulness for accountants. While meditation has been around for centuries, the practice of mindfulness is comparatively new. While in meditation you are practising mindfulness, that experience of present moment awareness and focus. Kabat-Zinn has developed different types of meditation that he calls mindfulness meditation, including guided visualizations that are directed-imagery exercises to relax your mind and body. These can include visualizations of walking along a mountain trail or along a sandy ocean-fronting beach. There are many such guided imageries available online. He has also advocated body scan meditations where you mentally scan your body and take notice of each area. You develop the ability to be more aware of our body’s present state of being and the simple act of non-judgemental observation helps the body rebalance. Being mindful is not limited to meditation. You can also practise mindfulness in many activities, from preparing and eating a meal to gardening and even parenting — any activity where you can focus with full sensory awareness and intent, being mindful of the experience rather than mindless, as we often find ourselves when our thoughts are preoccupied and unconnected with what we are currently doing. This exercise is simple but incredibly powerful. It is designed to connect us with the beauty of the natural environment, which is easily missed when we’re rushing around. If you’re in an office and cannot get outside, find a window. Pick a natural organism within your environment and focus on watching it for a minute or two. This could be a flower, an insect, trees or clouds. In this exercise, all you have to do is notice five things in your day that usually go unnoticed and unappreciated. These could be things you hear, smell, feel or see. For example, you might see the walls of your office, hear the birds in the trees outside in the morning, feel your clothes on your skin as you walk to work, or smell the flowers in the park, but are you truly aware of these things and the connections they have with the world? Meditation and mindfulness have become the 21st century executive power tools, allowing us to calm and our focus our minds, especially at busy or stressful times of the year. From one accountant to another, they have made a difference in my life. Now it’s time to make a difference in yours.